I hope that you enjoy the Droidippy game, and that there are no serious problems that you want to report. But even if that is the case, I am sure there are some improvements that you would like to see. I myself can think of quite a few. But you who play this game are the authoritative source for improvement suggestions. Below I have enumerated a few improvements that I would like to create for the game, but the list is almost by definition woefully inadequate, so please comment this post and tell me about the improvements you want to see, and why. Or just tell me which of the improvements on the list you would most like to see. The suggestions that are best motivated, that I like the most, and that seem to have the most players behind them will be built in the immediate future. However, this is not a democracy, and I reserve the right to pick and choose. iPhone client. This is a biggie, I don't even own an iPhone, so it probably won't happen any time soon. But if anyone out there is a competent iPhone dev, send me an email and we can work together? A way to invite replacements for inactive players in games you created. A pretty tutorial with screenshots on this blog. 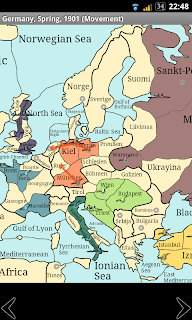 An easier way to send suggestions and responses, for example constructed map images, to simplify negotiations. 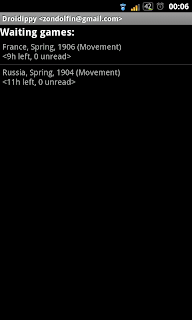 Some kind of visible achievements or badges (example: a small star in silver or gold on the flag in the chat signifying the "commit on time"-reliability of the player speaking). Some way of limiting the masses of email you may get when playing the web interface. Some way of avoiding and/or punishing misbehaving players. A friend system where you can mark other players as "friends", and more easily select them to invite to created games. What kind of an FAQ is this? 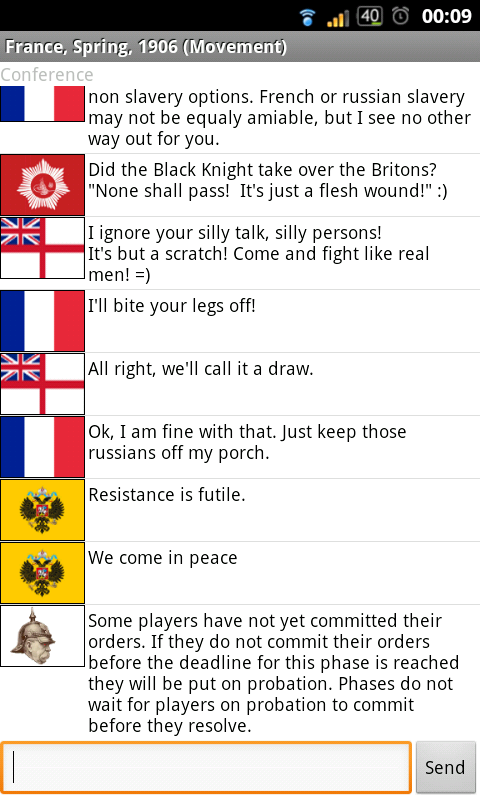 This is the FAQ for the Android interface to the Diplomacy like game Droidippy. 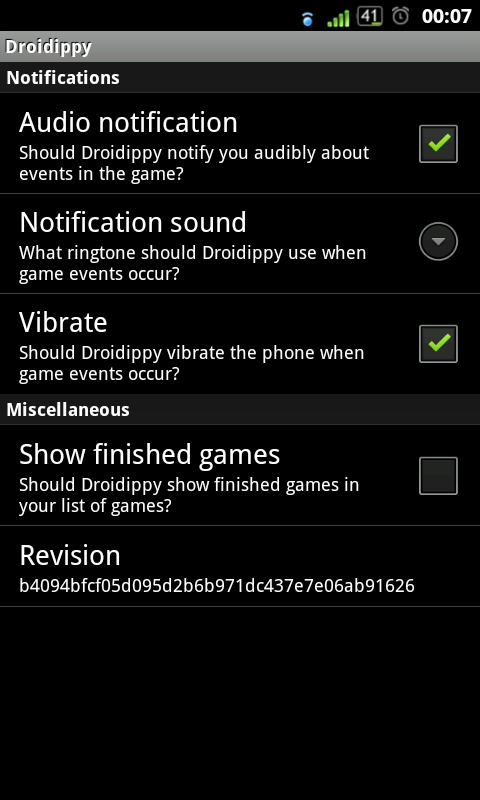 For gameplay questions that are the same regardless of interface, go to Droidippy Gameplay FAQ. When you first start the application, press 'Menu' and then 'Play' and 'Join random game'. You will be duly warned about having to know what you are getting into, and then you will get the option to rank the European great powers of 1901 according to how much you want to play them in the game. You use the black arrows at the bottom of the map view to switch mode between map, chat and orders. In the chat view you will be able to talk to any other player one on one, or with all of the players at the same time in the 'Conference' channel. You will also be able to select if you want a draw, or if you give up, using the 'Intent' spinner. 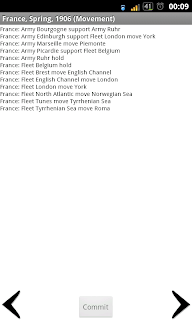 And how do I give orders to my units? You can pinch to zoom and pan on the map, and when you long click (more than 1/2 second) your own units (those starting in the country mentioned in the title bar of the application) you will get a menu of orders to enter. 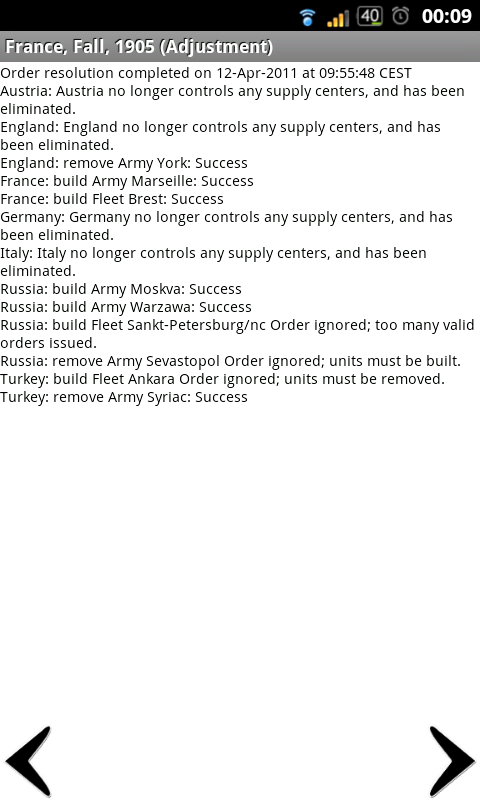 But the map moves when I try to long click the units, and nothing happens! Press the menu button, select 'Preferences' and try different values for 'Long click sensitivity' until you find one that suits your taste. I am unable to pinch to zoom, how can I select my units? In the preferences you can select 'Show zoom buttons', which will give you a '+' and a '-' button in the map view that enables you to zoom in or out without using pinch. Why do I keep getting the "This game client is too old..." message? I have upgraded! For some reason Android sometimes doesn't clean up the old installation properly when you upgrade. Try uninstalling and then reinstalling the application. I am told I need to upgrade my client, but there is no updated version on the Android Market? Sometimes Android Market is really bad at disseminating new versions. I have no idea why. In these cases you may have more luck if you download the installation file directly from http://droidippy.oort.se/web/static/Droidippy.apk. I am getting really annoying errors about the server experiencing errors, or that the server did not respond as expected. Fix it! Chances are that I have already fixed it. Try to upgrade to the latest Market version, and if that doesnt help use http://droidippy.oort.se/web/static/Droidippy.apk. If that doesn't help either send me an email to droidippy-mod@oort.se. For some reason I am unable to leave the preferences dialog. Maybe 'back' does nothing, and maybe if I restart the app it will bring me back to the preferences... what to do? To alleviate this problem (which is really a bug in your phone, scouts honor!) I have made the preferences dialog close if you click the version tag at the bottom. I no longer get notifications in my phone. Instead I get emails. Please send me notifications like before! To send notifications I use a Google service named C2DM. The phone registers to C2DM and then sends the subscription ID to the server which uses the subscription to send you notifications. The reason you get emails is that the server either has no subscription ID for you, or that C2DM claims the subscription ID is invalid. If your phone is turned off for too long, for example, the subscription ID may get marked as invalid. If the notifications only fail for you and not everyone else chances are that it is either your subscription or C2DM that is at fault. In both cases it may help to resubscribe to the C2DM service. This will happen if you reboot the phone or if you uninstall and reinstall the game. If none of these solutions work for you, please contact me at droidippy-mod@oort.se so that I can try and see what the problem is. How can I install this game on an Android device that doesn't have Android Market? The latest Droidippy client for Android is always published at http://droidippy.oort.se/web/static/Droidippy.apk, both because Android Market is sometimes slow to update when I need to push a new version and to enable devices without Market to install it. Note however that the authentication system is still Google, so you still need a Google account on the device. If you have more questions just add comments to this entry and I will add the question and the reply to the Q&A above. 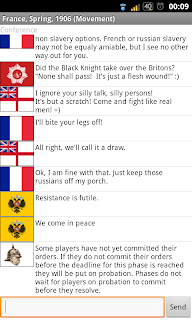 Droidippy is a Diplomacy like game running on devices compatible with Android 2.2 and having at least one Google account as well as most modern web browsers (if you have a google account yourself). Go to http://droidippy.oort.se to play right now, or go to the Android Market page to fetch it for your Android 2.2 compatible device. If you have never played Diplomacy it could perhaps be explained as being a mix of Risk, Poker, Chess and Rock-Paper-Scissors. It was supposedly the favorite game of John Kennedy and Henry Kissinger. If you have any problems, questions, comments, praise or complaints don't hesitate to send an email to droidippy-mod@oort.se! If you have ideas for improvements, or other suggestions, you can also post them on the Droidippy Wishlist. For discussion with other players, go to the Google Group Droidippy or join #droidippy@freenode.net. 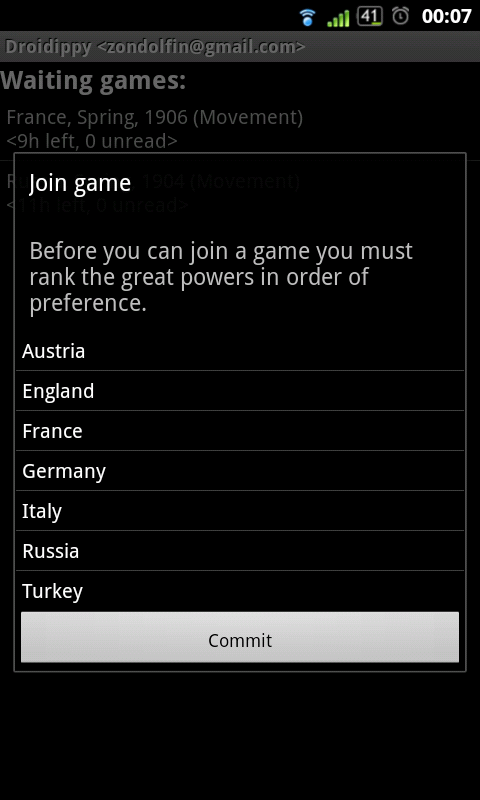 Several simultaneous games (for premium users) with anonymous players or your friends from all over the world. Keeps track of your deadline reliability, and sets you up with players of similar reliability. 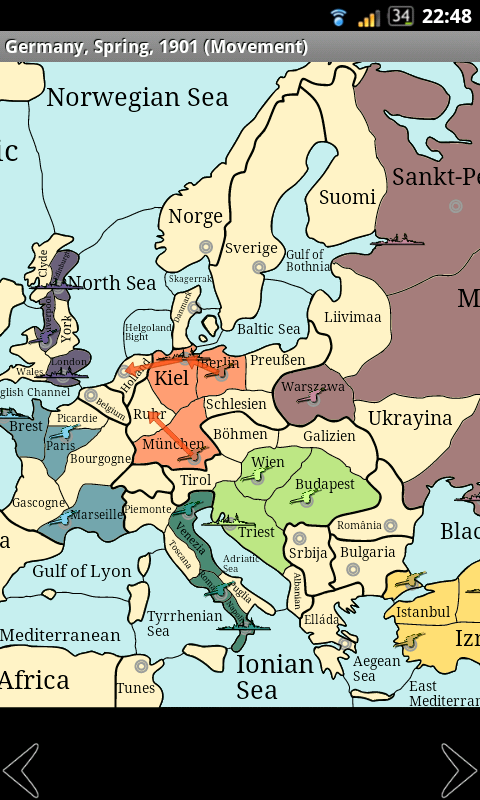 Vector based map with zooming, panning and (in Android long-) click to enter orders. Instant messaging, one on one and in a conference channel, in each game. Game global help and talk chat channel. 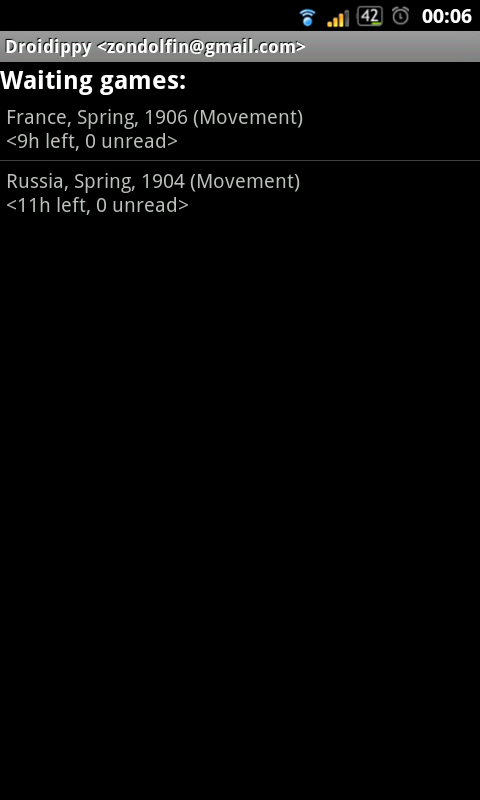 Configurable (in Android) notifications when messages are sent, phases resolved and games end. Browse history of games to check the performance of friend and foe alike. Clearly stated orders and results in text, if the point and click interface confuses. The web interface does not work in some Android devices, depending on whether their web browsers can render SVG images or not. The web interface is in a beta phase and may not always work as expected or advertised. Droidippy contains no explanations about the rules of the game. 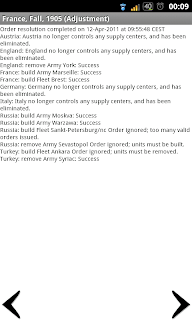 See http://en.wikibooks.org/wiki/Diplomacy/Rules for a full description of the rules. Joining a game is serious business. A player that abandons a game will ruin the game for his or her fellow players. Please only join a game if you are actually interested in following it through to the end.